Forbidden Affair is the new fragrance from the imaginative designer Anna Sui inspired by the land of dreams, fairy tales and fantasy. In this world, every girl can feel like a princess; she can be adorned and privileged, allowing herself a dangerous and forbidden romance with the prince of her dreams. Forbidden Affair fragrance reflects the forbidden love and a wild longing, fantasies and some long-past times, revealing the hidden passions that you did not know existed. The fragrant composition incorporates, for the first time, Cyclodextrin technology. This technology allows the top notes to re-emerge over and over again, invigorating for an ongoing sparkling fresh fragrance experience. Anna Sui Forbidden Affair begins with a romantic fairy tale told by fresh lemon and red and black currants, which are slowly developing into the heart of raspberry, rose petals and pomegranate. Tempting and somewhat mysterious aromas make this perfume not as innocent as it may seem. Intriguing accords of violets, cedar and musk form a seductive base of long-term affection. Top notes: lemon, black currant, red currant. Heart: raspberry, rose, pomegranate. Base: violet, musk, cedar. 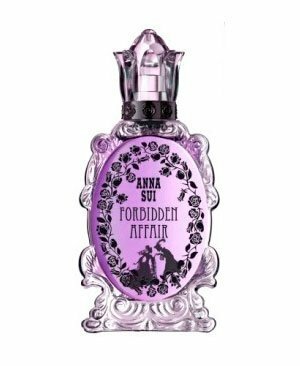 The Anna Sui Forbidden Affair 75ml EDT Women's Perfume was added to the Women's Perfume category in June 2016. The lowest price GetPrice has found for the Anna Sui Forbidden Affair 75ml EDT Women's Perfume in Australia is $36.09 from Fragrance Shop. Other merchants who stock it are Fragrance Shop, Price Rite Mart.